Both Amazon and Flipkart, which account for about 75-80 pc of the online retail business in India and rely on a handful of large sellers for majority of sales, together lost over USD 50 billion in market capitalisation on February 1. It is not perhaps ‘Acche din’ (good days) for the leading e-commerce sites as the new FDI policy for e-commerce has come into effect from February 1. The Department of Industrial Policy and Promotion (DIPP) rejected the request to delay the implementation of the new FDI norms for the e-commerce sector. Consumers of e-tailing websites will now have to pay relatively more and wait at least 4-7 days for their deliveries to arrive as compared to 1-2 days earlier. Following the decision, the two largest online e-commerce companies in India, Amazon and Walmart (that owns 77 pc stake in Flipkart) together lost over USD 50 billion in market capitalisation on February 1. Both companies have made big bets on the Indian retail market – with Amazon committing USD 5 billion here while Walmart spent USD 16 billion last year to buy a controlling stake in Flipkart. Gone are the days when one could get their hands on branded products at cheap discount rates. Amazon has removed a significant amount of products from its platform across categories like its Echo range of smart speakers and its private label products ranging from batteries, electronic accessories, travel accessories, grocery and apparel among others. Sellers like Cloudtail and Appario (where Amazon is a joint venture partner) have almost become nonexistent on the platform. According to industry estimates Cloudtail and Appario moved at least 50 pc of shipment volumes for Amazon, which are now largely unavailable to be sold. Flipkart will also be forced to remove thousands of products from its service, particularly in the apparel category, where it sells many clothing items made by affiliated companies. According to Technopak, an Indian consulting firm, Flipkart could lose as much as a quarter of its sales in the short term. Both Amazon and Flipkart, which account for about 75-80 pc of the online retail business in India and rely on a handful of large sellers for majority of sales, had strongly influenced for an extension of the deadline for the new norms which prohibits the e-tailers from selling products of companies in which they have stakes. Amazon had sought a four-month extension, whereas Flipkart had requested the government for about six months to comply with the new rules. Globally, Amazon’s international business reported losses of USD 642 million during the December quarter compared to USD 919 million in the year ago period- down by about 30 pc. According to a Crisil report, nearly 35-40 pc of e-retail industry sales – amounting to INR 350-400 billion – could be hit due to the tightened norms. The decision has been timely planned by the Modi government right before 2019 general elections. Not only did the government try to impress the middle class with its interim budget on February 1, but it also influenced millions of shopkeepers and small traders of the country who have tremendous power in votes and campaign donations. Amazon and Walmart will now have to turn their sites in India into digital bazaars for independent merchants. Snapdeal, an Indian online market place that couldn’t compete with Flipkart and Amazon in the prize wars was pleased by the government’s decision. “Snapdeal supports the immediate implementation of the current FDI policy on e-commerce so that marketplaces are not misused to run inventory operations,” the company said in a statement. A survey of common products currently available on Amazon’s Indian site suggests that after sales by its affiliated companies are banned, many products will disappear and others will become more expensive because they will only be sold by small merchants who lack the clout to negotiate low wholesale prices from manufacturers. 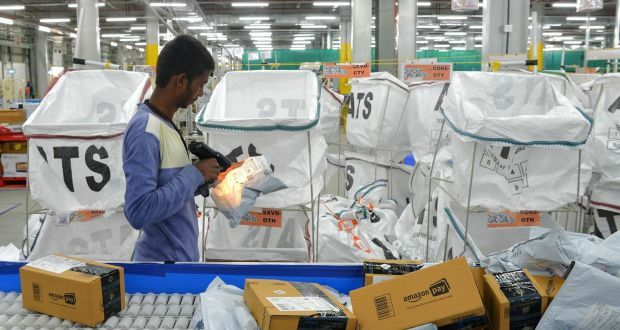 Confederation of All India Traders (CAIT) has already warned the government of a national campaign with political fallout if it defers the implementation of foreign investment norms in e-commerce. ‘Deep-discounting’ policy might end cheap online sales?